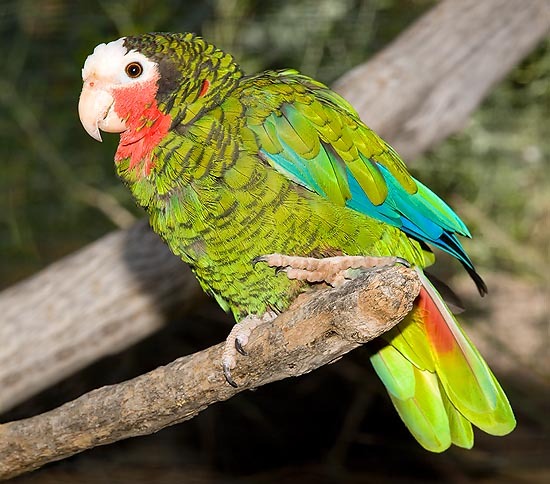 The Cuban Amazon, or Cuban parrot, called also Cotorra by the local populations (Amazona leucocephala Linnaeus, 1758) in German Kuba-Amazone, in French Amazone de Cuba, in Spanish Amazona cubana, and in Italian Amazzone di Cuba or Amazzone cubana, is a parrot pertaining to the order of the Psittaciforms (Psittaciformes), family Psittacids (Psittacidae), genus Amazon (Amazona), of the Neo-tropical bio-geographic area. Let us say at once that the systematics of this species of parrot, endemic to the Caribbean, is an annoyance for the taxonomical ornithologists. The biologists have identified as many as five subspecies: the Amazona leucocephala bahamensis (in German, Bahamas-Amazone), the Amazona leucocephala caymanensis (in German, Cayman-Amazone), the Amazona leucocephala hesterna (in German, Cayman Brac-Amazone), the Amazona leucocephala leucocephala and the Amazona leucocephala palmarum (in German, Westliche Kuba-Amazone). It is, without any doubt, a complex and controversial systematics, much discussed within the International Commission for Zoological Nomenclature (ICZN) and the Birdlife Society. And this is not enough, as the subspecies Amazona leucocephala palmarum and Amazona leucocephala caymanensis, after some prominent ornithological biologists, should little differ from the nominal species and therefore it should not be matter of subspecies. Moreover, specimens found in Great Inagua, the greatest island of the Bahamas Archipelago, placed at about 90 km from the eastern extremity of Cuba Island, should represent an additional subspecies. At last, the Amazona leucocephala forms along with the Hispaniolan Parrot (Amazona ventralis) and the Yellow-billed Amazon (Amazona collaria), such an homogenous group to be classified as super-species. The Cuban Amazon is enlisted into the Appendix I of the Convention of Washington, 1975 (Convention CITES), whereby its trade for commercial purposes is forbidden; after the IUCN it is an endangered species, and the same goes for the relevant subspecies. The danger is caused by the heavy deforestation, the introduction in the various islands of predatory animals, such as the cats, and by the open hostility of the countrymen, who see in them a danger for the cultivated fields. They are rare species and subspecies and their zoogeography is complex. In order to facilitate its comprehension, the ornithological biologists have separated three basic groups, distributed in the following areas: Caribbean (inside which Cuba is the most populated centre), Cayman Islands, and the Bahamas, where, however, they are getting more and more rare during the last years. The races Amazona leucocephala leucocephala and Amazona leucocephala palmarum, along with the nominal species Amazona leucocephala do form the first group, localized in Cuba Island (especially the centre of the island) and in the Isla de la Juventud; the second group is formed by the Amazona leucocephala caymanensis, located in Cayman Island and by the Amazona leucocephala hesterna, present in Little Cayman Island and Cayman Brac; the third one is formed by the subspecies Amazona leucocephala bahamensis, in the Bahamas, the Inagua Island and, in the past, also in the Crooked and Fortune islands, where nowadays they have disappeared. The Cuban Amazon is shyer and more careful then the various subspecies, as it tends to live more in the hinterland, far away from the urbanized and touristic locations. The nominal species, along with the five subspecies, colonizes same biotopes in the geographic areas where they are present; they are met in the plain and mountain forests, furthermore they have a penchant for the conifers and the small palm woods; they nourish frequently in the cereals and maize cultivated fields as well as in the orchards. The Amazona leucocephala and the Amazona leucocephala leucocephala, have the green as predominant colour of the plumage, each feather is bordered of black, the front, the upper part of the skull (from which comes the wording leucocephala) and the area around the eye, are white. The cheeks, the throat and, at times, also few feathers of the thorax, are red-pink; the feathers covering the ears have a duller black colour. The abdomen is dull red, the primary coverts, the first remiges and the borders of the wings are blue, whilst the secondary coverts and the secondary remiges are of a duller blue. The rectrices are yellowish-green; the upper side of the tail is green, the base of the outer rectrices is red. The periophthalmic ring is whitish, the pupil is dark, and the iris reddish-brown and the zygodactylous feet are light brown. In the immature pullets, the feathers are not surrounded by black, there is a reduced presence of the red-pink colouration, and the abdomen has a reduced quantity of red. This last colouring at times is even absent. There is absence of sexual dimorphism between males and females, seasonal as well as permanent. These parrots are up to 32 cm long, per 300-310 g of weight. The wingspan is of 18,3-20,4 cm. The subspecies Amazona leucocephala bahamensis has a livery similar to that of the nominal species, but the white dot, which gives the name to the species, is much more expanded on the entire front, the upper part of the skull and the cheeks. The red patch on the abdomen is either totally absent, or markedly present, finally, there is less red colour at the base of the outer rectrices. There is absence of sexual dimorphism between the sexes. The parrots of this subspecies are longer, about 34 cm, the wingspan is of about 20,0-21,7 cm. 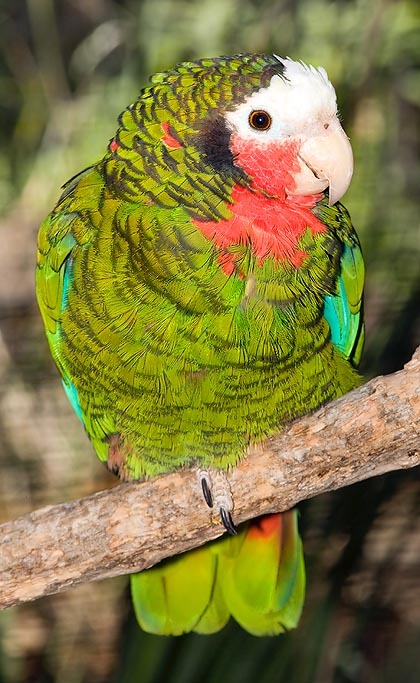 The livery of the subspecies Amazona leucocephala caymanensis, is, in many ways, similar to that of the nominal species, even if there is much more yellowish-green as colour, the black outline of the feathers is not so pronounced, the white is limited to the front and extends up to the eyes, the red-pink colour of the throat and the cheeks is often interrupted by the presence of green feathers, the red dot of the abdomen is poorly coloured, even if noticeably larger. Also here, there is absence of sexual dimorphism. They are 34 cm long and the wingspan is of 19,2-20,7 cm. The subspecies Amazona leucocephala hesterna, has a more yellowish-green livery than the nominal species, the abdominal patch is larger and is of purple colour, the white dot of the front is smaller, whilst the throat and the cheeks are much orange. Also here, there is absence of sexual dimorphism. These are smaller animals, measuring about 30 cm, with a weight of 290-300 g and a wingspan of 17,1-18,5 cm. The Amazona leucocephala palmarum, has a livery similar to the nominal species’ one, but, usually, is somewhat darker in the colours, the abdomen is markedly wine red, with a much expanded dot. The throat is deeply red. There is absence of sexual dimorphism. They are 32 cm long, weighing 300-310 g, and have a wingspan of 18,7-20,2 cm. The nominal species as well as the subspecies does have the same alimentary ecology: they eat seeds, fruits, soft fruits, buds of new leaves, pine cones. They are therefore granivorous, frugivorous, anthophilous and furthermore they often forage in the cereal cultivated fields and in the orchards. For all of them, the average life span is of about 40 years. Both the nominal species and the subspecies live in monogamous pairs or in small flocks of 30 members, especially in the periods beyond the mating season. The specimens living in the hinterland are shyer towards the man than those living in the urban or tourist centres. When annoyed, they become wary and suspicious and hide. They are noisy, especially while flying, silent during the meals. They fly in straight line and quickly, even if the flight is characterized by heavy wing beats. The call is sharp and metallic, and is accompanied by a vast vocal repertory. The mating season falls between March and August. The male builds nests either in the hollows of the trunks or on dead branches. In some instances, like in Abaco Island, it may build up the nest on calcium deposits which have emerged from the coral reef which surrounds this island of the Bahamas Archipelago. The female lays 2-5 eggs which measure 3,5 x 2,82 cm and the hatching lasts 26-28 days. The pullets are nourished for about eight weeks, but when they are too numerous, some of them maybe left behind. The parents are much careful and attentive during the breeding of their offspring. During the first four weeks, the female will never abandon the nest, and it will be the male’s duty to take care of her sustenance. Then, it will start to get away for getting the food, and the pullets, nourished twice a day, will remain in the nest alone and unwatched. Once left the nest, the sub-adults remain however with adults for long periods before forming their own family.